With the April 2018 update, you can now apply many different profiles, or ‘looks’ in Lightroom CC, Lightroom Classic and Adobe Camera Raw. We’re used to Lightroom updates being relatively low-key affairs combining a handful of tweaks, the occasional experimental feature, a few bug fixes and some noises about performance improvements, but this announcement is a big one, thanks to the introduction of a ‘profiles’, and a whole new way of applying image ‘looks’. Lightroom Mobile now has the ability to apply geometric corrections and grain effects. I’ll cover these in separate posts, but for now the main story with the April 2018 update is that Lightroom CC, Lightroom Classic and Adobe Camera Raw all benefit from these new profiles. Camera profiles are different ways of interpreting the colour and brightness values in a RAW file. Maybe you didn’t even know there was such a thing, because until now they’ve been hidden away in the Camera Calibration tab. By default, Lightroom and Adobe Camera Raw apply a default Adobe Standard profile with subdued colours and low midtone contrast. Heaven knows I’ve complained about it often enough. But in the Camera Calibration tab you can (could) choose different options, including rather good simulations of the colour modes provided by your camera. So, for example, if you shoot with a Fujifilm camera you’ll find Velvia, Astia and Provia profiles which give a much richer and more saturated rendition more in line with the camera’s own ‘looks’. But what Adobe has done with the April 2018 update is simultaneously move these profiles to a much more prominent position in the Basic tab, and massively expand them with a whole range of other ‘looks’ in both colour and black and white, and encompassing modern, retro, hipster and vintage looks at the same time. What these profiles now provide is a much more immediate and accessible way of applying a basic ‘look’ to your pictures before you head off and start adding your own manual adjustments. It’s implemented really well, too, with profiles organised into logical categories and a profile ‘browser’ that lets you see a thumbnail rendition of each profile before you make a choice. Before we get too carried away, though, it’s worth pointing out a couple of things. One is that this introduces a lot more ambiguity about how you create a particular ‘look’. Do you use a profile, or do you use Lightroom/Adobe Camera Raw’s regular adjustment tools to achieve the same effect? So far, after a quick browse through the new profiles, it does look as if it ought to be possible to achieve similar effects using the regular editing tools or with preset packs bought from preset vendors. Second, because these profiles are not created using regular adjustments (or with controls in the Calibration panel, which is still available), they can’t be altered. They are very much a take-it-or-leave-it choice in much the same way as LUTs (lookup tables), though you can change the strength/amount value with Adobe’s own profiles. Finding out what these profiles can do and how best to use them is going to take a little time, but one bit of good news is that Lightroom CC gets these profiles too. 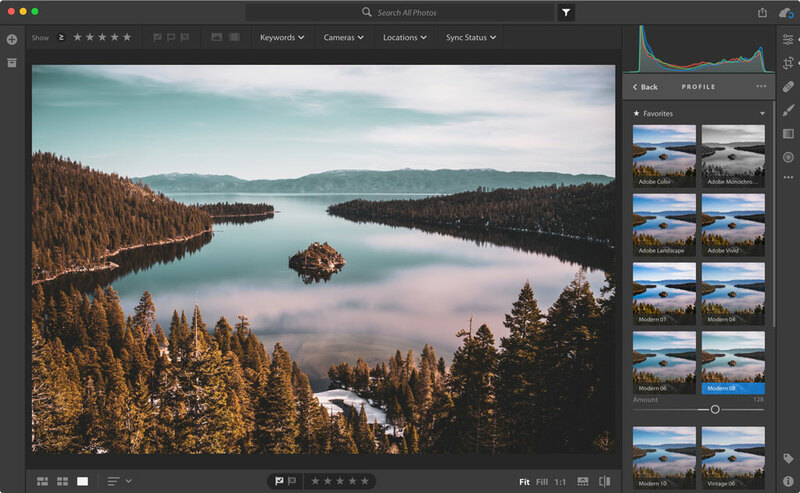 Previously, the Adobe Standard profile was the only game in town for Lightroom CC, but now you can simulate your camera’s profiles and try out Adobe’s own creative profiles in Lightroom CC too. Now all Adobe needs to do is add plug-in support to Lightroom CC, and I’ll be happy (well, happier).